First of the ordered toothbrushes came within a day. Nice! I have described my selection process here. I'm talking about the Cebra wooden ones. What bothers me is the packaging and the fact that producer is very vague about the material the bristles are made of. It only says: natural, and packaging is a piece of plastic which is supposed to be biodegradable. Well, all plastics are biodegradable only some take thousands of years to do so... I've asked them, and we'll see if they answer. UPDATE ON THIS BELOW. I'll probably also experiment with water and such, as this wrapping does feel different to the touch, a bit like the soluble stuff used for dish-washing powder wraps. The toothbrush itself is nicely made. A bit short, but still O.K. to operate. Very well finished, smooth and pleasant to touch. There is no wood aftertaste, someone mentioned somewhere at all. Bristles are on the harder side, but I like them. They get softer when soaked for longer and I get the feeling that I don't have to brush as hard as with plastic ones to still get them actually reach everywhere. Also, even though they're quite hard, I didn't get any irritation or scratches on my gums. My husband also likes this toothbrush and described it as very pleasant and not at all hard. He just thinks it will not last with his braces. We shall see. Not only did the producer answer my questions about the bristles material and plastic wrapping, but they've also made proper changes to their product description. Good for them, because bristles are boar hair, which is indeed natural, I just hope they come from shaving them as opposed to less humane methods. But these are very good for enamel and for the environment. The wrapping is apparently cellophane from maize. Almost perfect, as cellophane degrades without harmful effects in 5 months tops, and if it isn't treated with some extra glazings and such it could dissolve in water in a month. It's made of maize though and apparently the process is not so great as it does produce some nasty chemicals, but then again every plastic production does. It would be ideal not to get this wrapping at all, but if the producer thinks it's safer for the brush head and absolutely has to have something I think it's not a bad replacement. There is a great article about cellophane here if you're interested in learning more. One month into using Cebra toothbrushes, and I must say I love them. 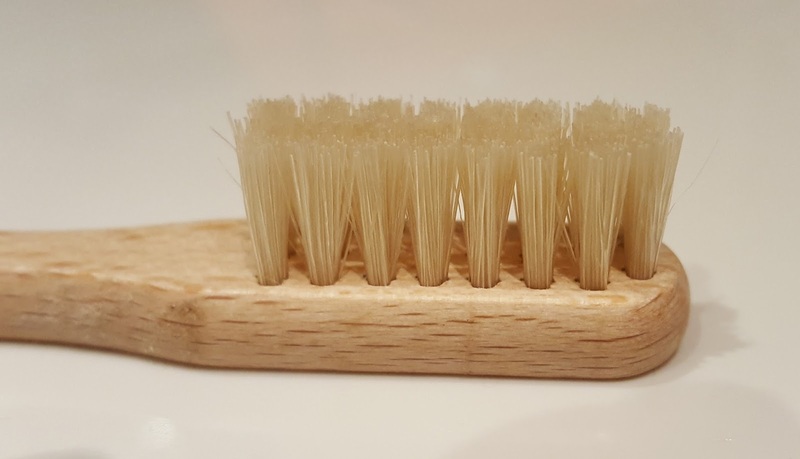 Bristles are slightly used, but they still feel good and swipe stuff off my enamel brilliantly. Feeling-wise they are definitely better than plastic counterparts. Literally 4 bristles have fallen out. First one on the first day I've used them, and it felt a bit disconcerting, but that was all. At this point, the bristles look and feel exactly the same for the past two weeks. No visual change. After 30 days of brushing twice a day, my toothbrush looks like this in comparison to my previous brush used for exactly the same amount of time. I used medium firmness plastic ones (well known brand) and Cebra certainly feels like medium. Wouldn't you say they seem better than the plastic ones? Next step will be putting them into a jar full of rain water to see how they biodegrade.